This month’s newsletter is shorter to give you more time to view an informative one-hour webinar on “Getting to Know Trillions of Friends Underfoot – Focus on Soil Life”. The more we know about these little helpers, the more we will be able to help them work for us and our plants this summer. Only “living” things can be spoken of as having “health”, so we should view soil as a living, breathing ecosystem. 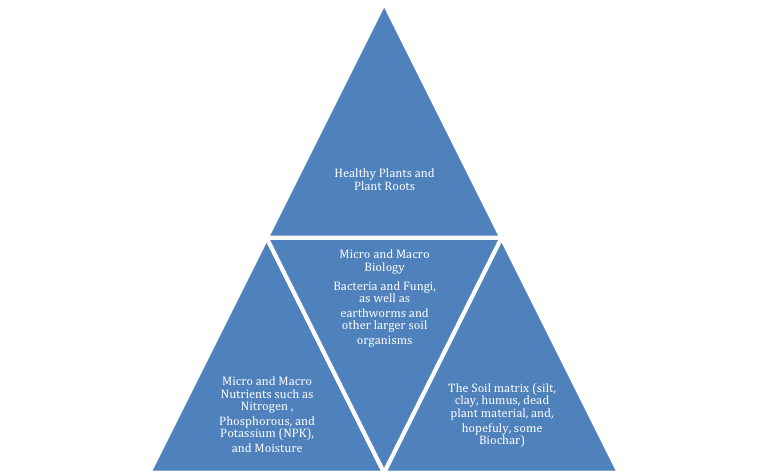 Soil isn’t inert; it is teaming with billions of bacteria, fungi, and other microbes that are the foundation of an elegant and interdependent “Soil Food Web”. Soil is an ecosystem which, when managed well, provides nutrients, root protection, and structural support for plant growth. It also absorbs and holds rainwater for use during dryer periods; it filters and buffers potential pollutants from entering our waterways; and provides beneficial habitats for soil microbes to flourish and diversify and keep the whole ecosystem running smoothly. https://www.nrcs.usda.gov/wps/portal/nrcs/main/soils/health/ – These excellent resources and webinars go into greater depth on the topics introduced in the YouTube video I just shared. Each sub-link provides very helpful descriptions of the soil food web, bacteria, fungi, protozoa, nematodes, arthropods, and earthworms. The more I learn about soil biology, the more curious I become. It is interesting to learn how soil organic carbon is a necessary component for soils to support all of the various actors in the Soil Food Web; and how, vice-versa, a healthy Soil Food Web maintains a high level of soil organic carbon. Sometimes soils need a little help to replenish the soil carbon when soils have become degraded. Nature does this through occasional forest fires that leave behind large amounts of charcoal (nature’s biochar) – the reason a forest floor turns into a lush green carpet of new life after a forest fire. We can mimic this natural process by amending biochar to our problem soils to give them a soil carbon boost and stimulate the Soil Food Web back into action. Once biochar is present in the soil it is stable for a long time and continues providing support for the microbiology of our soils for a long time. Biochar can even help healthy soils remain healthy with the harsh weather we are currently experiencing..
Last but not least, AirTerra is one of 15 companies selected to pitch for funding at the Calgary Fundica RoadShow event taking place on May 4th, 2017 at The Commons, 1206 20 Ave SE, Calgary. The winner of this cross-Canada pitch contest wins $1,000,000 in funding. Wouldn’t that be glorious! You are welcome to join us by clicking on the link below to register for this event (use the Fundica promotion code: FRIENDSFAMILY25 to receive a 25% discount). Come cheer us on and share in the excitement as we do our best to tell the story and raise the funds needed to set up a SoilMatrix Biochar packaging facility in Calgary! Click here to register to attend AirTerra’s pitch for $1,000,000 to fund expanding biochar sales in Canada! Hope to see you at the Calgary Fundica RoadShow pitch on May 4th, but see you all for sure at the end of May… the garden planting month! Welcome to our March 2017 SoilMatrix Newsletter – the importance of Soil Microbes edition. This month’s newsletter contains some wonderful surprises that arrived in my email this past week. I want to share them with you. The first surprise was a blog written by Donna Balzer, an award winning television host, speaker, CBC gardening expert, consultant, and journalist. Donna and I recently had a great discussion about the potential for using biochar as a soil amendment to improve the soil’s ability to retain nutrients and moisture and, moreover, to create a welcoming home for plant friendly microbes and fungi. Donna’s blog includes a video in which Donna demonstrates how to inoculate your biochar to take maximum advantage of biochar’s ability to carry soil microbes to your soil. A link to the video in Donna’s blog is available by clicking here. The second surprise was another blog written by Rob Avis of Verge Permaculture. In this blog, Rob provides some wonderful resources for learning more about how important it is to encourage beneficial soil microbes to move into our gardens to support plants, trees, flowers, or vegetables, to be healthier and more resilient against diseases and pests. Click here to go to the Verge Permaculture blog or here to view a video clip included in Rob’s blog were Mike Dorion of Living Soil Solutions provides a detailed discussion on how this can all be accomplished with some basic permaculture methods. 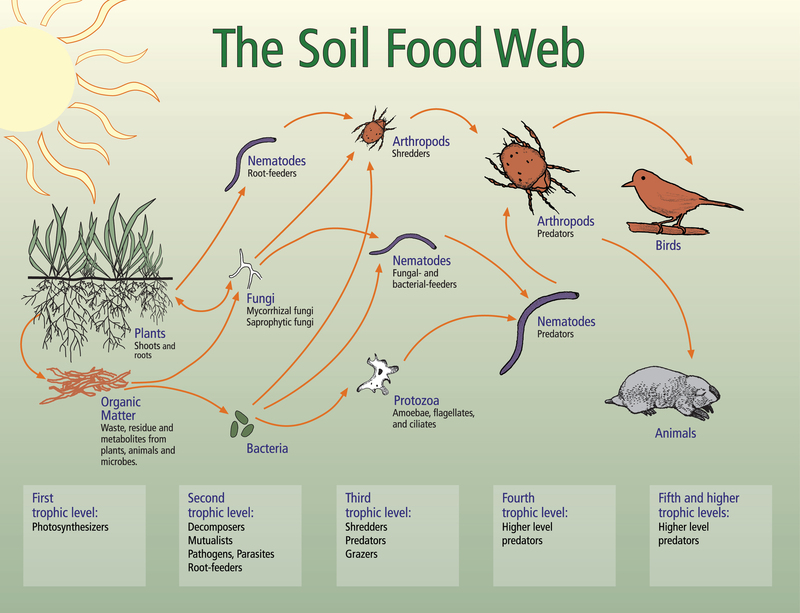 Both of these blogs highlight the importance of the “Soil Food Web” to encourage healthy vibrant and nutritious plants. The USDA provides a great info graphic to illustrate the various components of a healthy soil. Notice that “organic matter” is the starting point for bacteria and fungi to thrive. Biochar is one ingredient that can boost your soil’s organic matter in a way that stimulates these beneficial microbes to thrive. 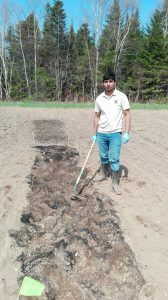 Blending AirTerra SoilMatrix biochar into Memorial University Field Trials.